This unabashedly silly book celebrates the creative side of failure. Go to the Principal's Office! Question: What did Paul Revere say at the end of his famous ride? If you answered "Woah!" then you're correct! At least according to this hilarious compendium of outrageous answers from the author of the national bestseller F in Exams. 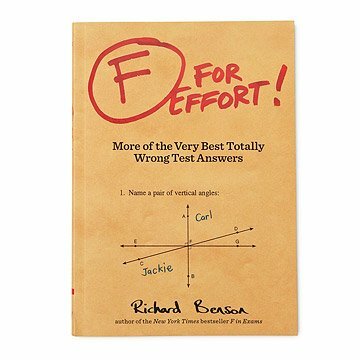 Celebrating the creative side of failure—from sassy mathematical solutions to hilarious reimaginings of historical events—this unabashedly silly book celebrates the creative side of failure with 250 authentic responses to common test quandaries from K-12 jokesters. This unbelievable assortment of audacious longshots contains questions from the sweat-inducing pop quizzes of the past, but rather than drawing a blank these students took being on the spot as an opportunity to be in the spotlight! No subject is safe from snark in this amusing book full of groan-worthy gaffes supplied by class clowns across the USA and the UK. A touching, funny, and oh-so-real look at the life of the average educator, this little pick-me-up is sure to bring smiles to any student, teacher, or professor. Printed in China. Real tests! Hilarious wrong answers ! Fun bedside or coffee table fodder. I needed a small gift for my dad for Christmas, and this seemed perfect! He already read it and loved it! Great gift for teachers, students, and grads. It's fun to pick pages at random, there's something funny on nearly every page. This book kept my grandchildren off their tablets. I have one of the other books in this series. It is a bit of comic relief to the struggles of being a teacher (or parent). It's a bit sarcastic and tongue-in-cheek, so as a teacher you can appreciate it more. It was fun to read. Not the type of book you keep in your library or read more than once but would be fun to pass around to K-12 teachers.